A day after making plea for his life on Facebook, Utahn Josh Holt appears in new prison video saying he’s OK but still needs help from the U.S. 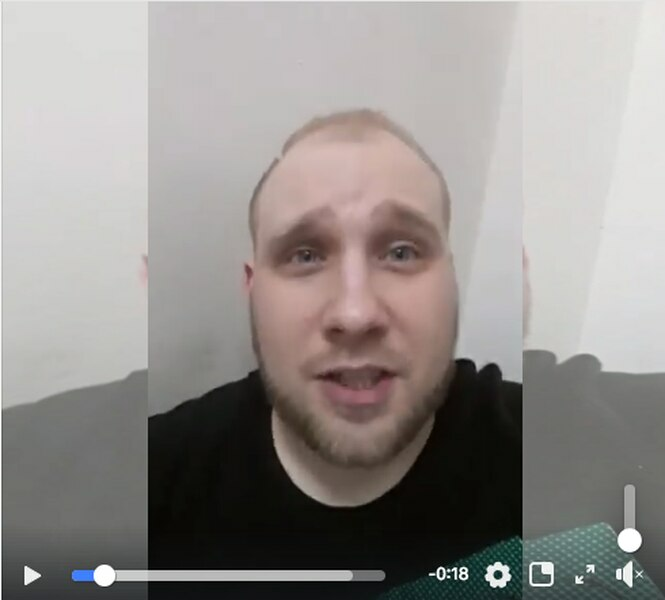 In a screen grab from a video posted Wednesday on Josh Holt's Facebook page, the 26-year-old Utahn begs for his life as the Venezuelan prison he'd been held in since June 2016 is under siege. A new video of Josh Holt surfaced on Venezuelan television Thursday morning, and this time, the Utahn tells viewers he has not been harmed in an ongoing prison revolt, but that he and the other prisoners still need help to escape. The new video, tweeted by Venezuelan TV network TV Venezuela, is at least the fourth featuring Holt that has surfaced since prisoners on Wednesday took over the Caracas prison, known as El Helicoide. Holt asks viewers to save him, his wife and the other prisoners, many of whom he says have been in the prison without due process rights and access to adequate medical care for years. Those conditions prompted the recent revolt, which comes days before the expected re-election of controversial President Nicolas Maduro, The Associated Press reported. On Thursday afternoon, 72 prisoners — excluding Holt — were transferred from El Helicoide to other detention centers, according to The Associated Press. The prisoners were also to receive medical care. Holt, who traveled to Venezuela in 2016 to marry his wife Thamara “Thamy” Caleno, has been in prison since June 2016 on allegations he and his wife illegally possessed weapons. He and his family deny the claims and believe the Venezuela government is holding Holt and Caleno in prison to bargain with the U.S., perhaps over economic sanctions the U.S. imposed on the state, which is in a dire economic crisis. While Holt appears in the Thursday video to be wearing the same black T-shirt he wore in videos posted to his personal Facebook on Wednesday, the new video draws a stark contrast to the two initial videos. In his earlier videos, Holt seems panicked, telling viewers the prison had been taken over by people who want him dead and that he feared for his life. In a third video posted Wednesday by TV Venezuela, Holt seems to clarify his earlier, desperate statements and appears along side three other prisoners. He says that he hasn’t been kidnapped by inmates, whom he calls friends. “The only people that are kidnapping me is the government of Venezuela. We need the people to help us,” he says. Holt’s initial videos caught the attention of Utah’s Sen. Orrin Hatch and Rep. Mia Love, who released statements saying they were talking with U.S. representatives and Venezuelan contacts to ensure Holt is safe and to try to get him released from the prison. On Thursday, Hatch’s office released a short update about their efforts, saying Hatch — who has been involved in the situation since soon after Holt’s detainment — is still working to keep Holt safe and get him and his wife released to the U.S.
“While the ultimate goal is to get him and Thamy back to his family in the United States, our primary objective at the moment is to ensure his safety,” Hatch spokesman Matt Whitlock said in a statement.